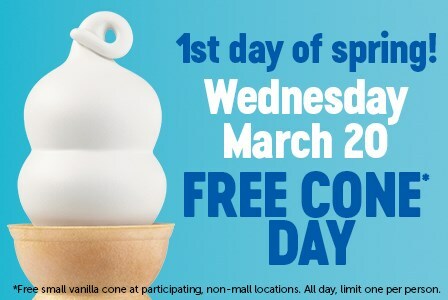 March 20 is the official start to spring, and Dairy Queen stores nationwide are celebrating with us. All day long at participating non-mall locations, customers can receive a free ice cream cone. As with anything this good, there is a limit of one per person. Not sure where a local DQ might be? Check for the closest location to you by clicking here.